Facebook and Twitter will be pulling all of the info. wagons until further notice. Thanks SE folks. 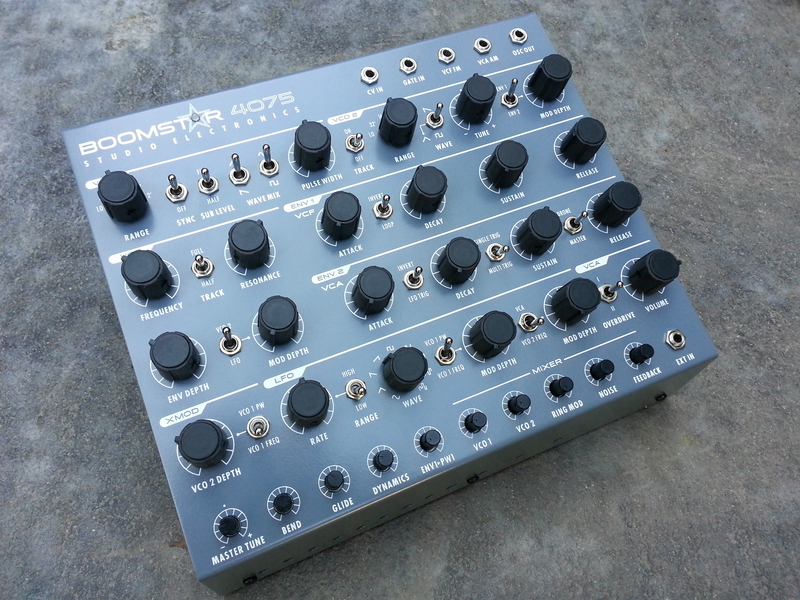 studioelectronics.com/support/tutorials/ … Get your Boomstar completely up to spec! 2.6.14 - GET YOUR RED HOT SE TEES AND HOODIES! Premium quality tees and hoodies for women, children, and their men, are now available at our spreadshirt site - more vintage designs to come! If there is an SE product/logo/sizing/placement combo you don't see, or want hoodies on your long sleeve tees, just shoot us an email at studioelectronics@sbcglobal.net first. It's easy peasy stuff to customize (at no extra charge of course), although the selection is quite extensive as it is ;) Coffee Mugs anyone? Organic Totes? We're very pleased to share a booth this year with Richard Nicol and his Pittsburgh Modular crew (Rick was one of our marvelous booth-mates last year, thanks to the 11th hour heroics of the good folks at noisebug). PM and SE are in business together these days,––exciting––co-designing and building a 2014 fresh line of high-end Eurorack synths. Who says beer summits can't/don't accomplish anything? Rick and I are unimpeachable evidence to the contrary; the Indian food was way decent too. Read all about the co-branding and teamwork at pittsburghmodular.com, and come by to touch the euroBoom gear and everything else captivating lying in wait for you from BOTH companies at NAMM! "Plenty o' lightening fire pans, volume draws, and faux stereo imaging and offsets: it's fun breaking out the pencil in DP, once the hard work of sorting, copy and pasting, and reversing the compliant bits (which are too versatile to only enjoy forwards) is in pocket - at least for the moment. A lovely chorus plugin was employed from 42.05474 to 44.48142. Apart from a touch of normalizing, the rest is raw, feral, uncompressed, unlimited, unadulterated BoomstAr bounce." "A Tombstone quality Boomstar 5089, 4075, 3003 filter shoot out/comparison. No tricks: no compression/limiting or gain maximizing, EQ, or plugins, just those snappy Studio Electronics hardware envelopes doin' work..."
Our no longer little Boomstar S.E.M. continues its variations on the drumming, "synthing," "percussioning," and processing external sources theme. 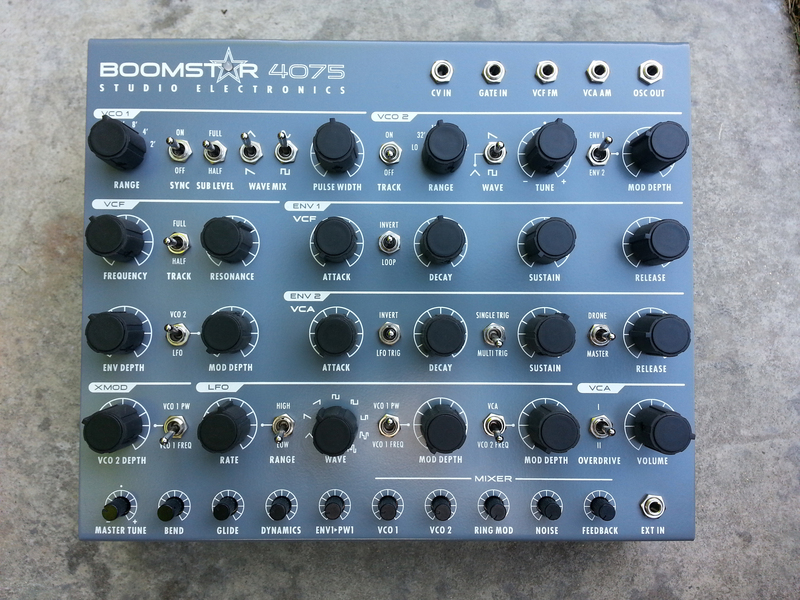 An altogether––well nearly––new Boomstar Synthesizer photo gallery whose "inhabitants" look good enough to smash. Who knew the SEM filter/MiniM--g style VCA hybrid would make such beautiful drums and lines together? Video of Drew Neumann's Canterbury Prog-Jazz Fest with additional MSR intro and outro SEM sweetening - actually this is an isolated track/performance, in contrast to the collective performance of 4.22.13. Drew Neumann gets his Canterbury Prog-Jazz on (with a not so soft machine), and I, MSR, reacquainted myself with my co-tweak/4 hands sensibilities from the discomfort my hard producer's chair. Universal Boomstar User Manual is now available as a free (obviously) download AND it's Camille Theriot St. Regis' 21st Birthday! Happy Birthday Daughter! Seni seviyorum! Yep, the 1st Boomstars left our El Segundo Factory. 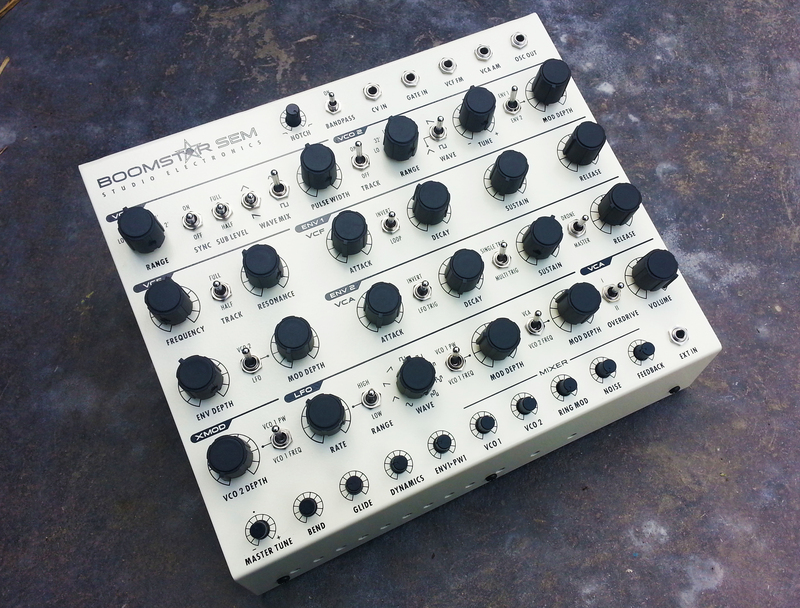 Boomstar 3003 Production Unit Demo. Produced and edited by Marc St. Regis. It's dirty. 1st Production run dirty. An alternative audio take for your unfiltered listening pleasure? Why not. Drew Neumann's single track twisting and turning of the Studio Electronics Boomstar 4075 - nothing too fancy as requested - for the sole purpose of getting to know the structural tonality and flexibility of this ARP-filtered SE synth is a near revelation. 1.31.13 - NEW BOOMSTAR DEMO FEATURING CORRECTED AND PERFECTED VCAs! A 4 hour tour of Boomstar 4075 and 3003 sounds from top to bottom, tracked in DP7.24. No EQ, compression, or plugins, other than a gate sequencer on a freeform "NAMM iphone" recording/track to tempo match it, and one or two delays on certain lead tracks. No mixing, no mess--just a faders up affair with a few soundbite fades: all pillows removed. Component/construction kit tracks will be uploaded to SoundCloud as well. In the composer's own words: "This is done ONLY with the 2 Boomstars--all noises, drum tracks, everything is the 4075 and 3003, overdubbed like crazy in Digital Performer. Most tracks are dry and raw, just delays on a few channels. There is just a final mastering limiter bounce on the mix file, that's it." Wild and free 4075 and 3003 explorations, by the one - the only, DREW NEUMAN! My Sonic State live demos tended toward the traditional and, so we stretched out a bit today. Noice. For all news and SE info please visit our facebook page and or follow our Boomstar Twitter feed, at least until the year end holidays are past ;) And Merry Christmas! Not the "SEM" old song Analogians. 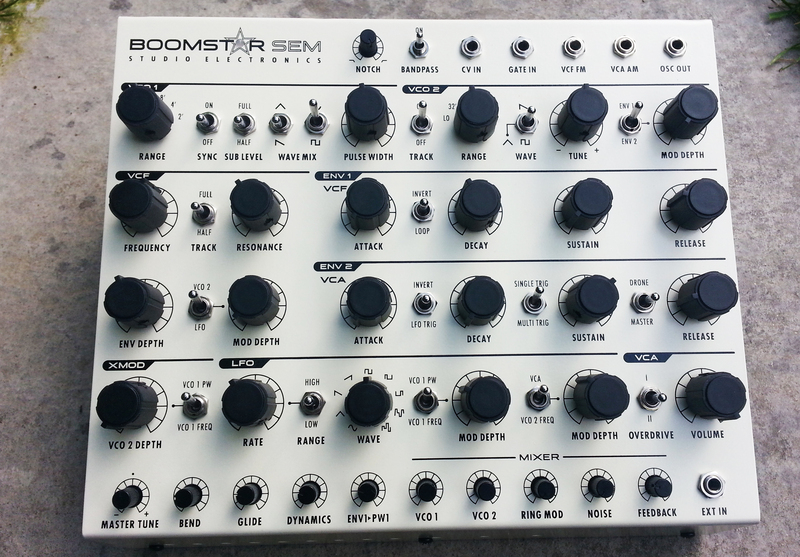 10.09.12 - 1st Actual BOOMSTAR Pic! 10.01.12 - BOOMSTAR on YouTube! Greg St. Regis' clever twists and turns launched the first 4075 Boomstar past "the surly bonds of earth," via a cheap audio interface that happened to be around. More Boomstar filter type demos, live footage and markedly superior D/A Converters to follow... and yes we should have uploaded the vids to our Boomstar "Featured Channel." It's hard to remember everyting important. Next filter type demo upload, expect to find all of the material there. We've just about done it Maria Therezia Capretta Theriot St. Regis! 8.13.12 - Studio Electronics ATC-Xi controller for TouchOSC (iPad app)! Our friend, musical dynamo and tech genius Federico Solazzo writes: "The idea was to have all the needs in the same panel in order to control almost everything under one hand and explore and experiment." We like and it's free. Back to the raw power and purity of discrete analog, where STUDIO ELECTRONICS started in 1985. The snap and punch of hardware envelopes drive the BOOMSTAR's brilliant voltage controlled circuits with unparalleled sonic integrity and versatility... This one's for you Mary St. Regis. Love Always and Forever. It's getting better all the time; and Happy New Year 2012ers! It's nice to get used sometimes... and thanks to everyone involved! Peter M. Mahr of greatsynthesizers.com makes the best argument here. Vintage charm, sometimes boyish, tiger wood (no relation), MSR, Mouse n' Mike and S.E. 's own Karate Kid should make for an engaging stroll through our Gallery Productivos and Gallery Humanos "Installation Experience" in the newly refurbished and revitalized Museum. All S.E. manuals in .pdf form are now to be found in a central location under the "down-up" heading/Operation Manuals: https://www.studioelectronics.com/down-up/operation-manuals/ Consolidation happens and it's proof of somewhat intelligent design. On our newly installed Video Page and rub shoulders with the Celebs on their very own Channel. And do give a listen to the fresh free-range crop of Omega8 and "C.O.D.E. only" demos - very enjoyable fare, care of the copious talents Chistoph Richter and ONEPOLYMER; our 2600 and CS-80 filters finally get a fair shake. Slate Pro Audio Dragon and Omega retrofit videos by Maestro Greg St. Regis. 7.22.11 - Search engine: check. Nothing quite like a good solid workaround. Kudos to Hostway (for a change) chat support. Galleria fixed, thanks to the marvelously responsive and helpful David Hellsing at aino.se; search database coming right up. Much will be familiar to the Analogia faithful, yet far easier to access, assess and enjoy! Opaque / overly stylized copy has been sidelined in favor of a good, clean, Premium Quality American read. This retool of all things SE, was too much for one man to handle, so the dreaded "coming soon" scandal does taint the love - I / we are doing everything in our power to inform those vacant pages in the coming (there's that word again) weeks and not months. And yes we are in the planning stages of a savage and extremely versatile new SE synth slated for a 1st quarter 2012 release. Please "sice" us with feedback and "friending" is always good. Thanks for your interest and support! p.s. The "Galleria" image gallery installed on the CODE, Red Eye, Dragon and Fox pages is not yet cooperative - it was running perfectly locally; I should have it sorted out in a day or so. Thanks for your patience!